Our 2016 Footwear Guide presented by Skate Warehouse continues, and this week we’ll be shining the light on Supra. 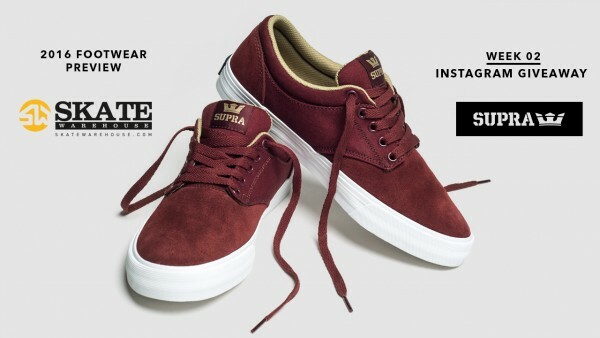 To start the week off, our friends at Skate Warehouse are going to hook up one lucky person with $100 to spend towards a Supra purchase on skatewarehouse.com! To enter, first make sure you're following us (@transworldskate) and Skate Warehouse (@skatewarehouse) on Instagram. Next, find the giveaway post and tag 3 friends in the comments. Lastly, cross your fingers! Winners will be private messaged this week. Good luck! Check back each day for new content from Supra and stay tuned for the next few weeks as we rollout the other brands.